2017/02/27 Thank you for staying. They are a family came from England. 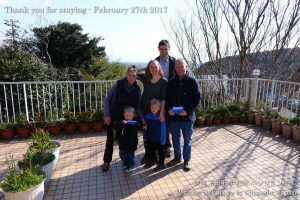 They have a family who live in Tokyo, so grandpa and grandma have come to Japan to meet their grandchildren 4 times before. During their stay they went to the beach under the blue sky on the 1st day, and went to Minami Izu town to see cherry blossoms and Irozaki cape on the 2nd day. The small children were very cute and they all are very beautiful family. This entry was posted in Customers, Pension Sakuraya on 2017年2月27日 by izusakuraya.